emily p. freeman runs this link-up once a quarter. And of course I don't keep track of new things I learn like she tells us to, so here's my best go at it. 1. Life is too short. It just is. If you have lost an immediate family member, you know this. It has been causing shifts in my thinking. 2. My feet remember the uneven paths of my childhood. It sounds like the first line of a novel. But it's true. There isn't a sidewalk for a block and half from my childhood home to the local shopping center. My feet knew the way. 3. 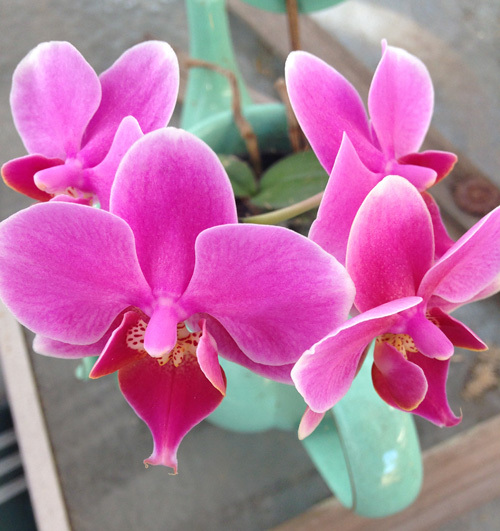 If you neglect an orchid, it will bloom profusely by itself. Bonus: you will also ruin your assistant rector's sermon as he used a metaphor about carefully tending orchids. Don't worry, he saw the picture of the orchids on Facebook and worked his way around it. I got this last year for my birthday. It got soaked in the monsoonal rains we had this winter, the roots rotting -- and all I did for it was empty out the water from its container. Once. 5. Chocolate wine. It tastes like chocolate liqueur. And that's not a bad thing.